Look up alveolar in Wiktionary, the free dictionary. Look up tubuloalveolar in Wiktionary, the free dictionary. If glands are categorized by shape, alveolar glands contrast with tubular glands. 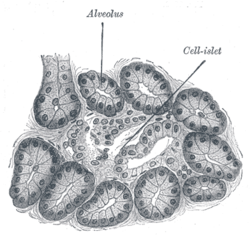 Alveolar glands have a saclike secretory portion, thus are also termed saccular glands. They typically have an enlarged lumen (cavity), hence the name similar to alveoli, the very small air sacs in the lungs. Some sources draw a clear distinction between acinar and alveolar glands, based upon the size of the lumen. A further complication in the case of the alveolar glands may occur in the form of still smaller saccular diverticuli growing out from the main sacculi. The term "racemose gland" is used to describe a "compound alveolar gland" or "compound acinar gland." ^ Histology at KUMC glands-glands14 "Compound Tubulo- Alveolar"
This page was last edited on 7 February 2019, at 20:41 (UTC).